Humans need a way to get around every day. Auto manufacturers are always on the lookout for ways to improve the experience, the way vehicles use technology and the overall appeal of the ride. This is why the auto industry is a big chunk of consumer tech. Just when we thought that the 2014 cars have all the best bells and whistles, tech companies come up with more to be desired in vehicles big and small. You may be thinking it is too far off to have a driver-less vehicle, but actually, during the Consumer Electronics Show of 2014, a vehicle called Navia Induct was introduced. It is the first completely electric self-driving vehicle to be made available in the United States. It looks a lot like a golf cart, except when you hop in it, you can touch the screen to choose your destination, and it does the driving for you – complete with laser mapping and sensors to avoid obstacles that get in your way. It is worthy to note that BMW presented a self-drifting car at CES too. It is really becoming a trend. If you thought Tony Hawk is cool or you are in the market for a cooler form of personal transportation, the Onewheel could be for you. The Onewheel is a self-balancing, motorized skateboard with one wheel. It is powered by a rechargeable battery and you steer with your body. It looks fantastic for urban spaces, especially since it can go up to 12 miles. Beats walking, don’t you think? Or is it just another Segway? Cars are getting more compact these days. However, those who are not really a fan of smaller cars or prefer scooters and bikes instead would enjoy the Urb-E electric scooter – a compact electronic scooter. What makes it amazing? It folds up to the size of a small suitcase, but can run up to 20 miles. Electric scooters are foreseen to be useful for commuters, the way the folding bike was a big deal when it first came out. Or hey, is it just another Segway? Audi Sport Quattro Laserlight has been just a concept car, but it pointed out particular tech that could be very helpful in the future. If the typical high beams can go up to 820 feet, laser headlights can reach up to 1640 feet and have three times the luminosity. If cars had laser headlights, it could mean greater visibility and much safer night driving. Audi also presented an exciting feature, traffic-light assistant. Its concept is to help people get to their destinations more efficiently by hitting more green lights. Connected cars are simply vehicles that have internet connectivity. This is a big trend for the automotive giants as they work out deals as part of the Open Access Automotive. It is not just going to be about fuel efficiency or smart cars, soon connectivity will be a must in vehicles too. 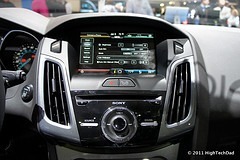 Infotainment system have been a big push for auto manufactures. Systems like Microsoft’s Sync have been at the forefront, but with poor reviews manufactures are looking to new alternatives. All the major players in mobile tech are getting on board. Apple has CarPlay and Google has Android Auto. These systems are more of an overlay of the current system in the car. Google is working on Android M which is more like Blackberry’s QNX where it is the command and infotainment center all in one. Cars are the next big frontier for tech. There is a lot to be considered, distracted driving, computer glitches and more. In theory tech will make cars safer and driving more enjoyable. I for one look forward to more technology in cars.